I’m so thankful to have Sarah from Little Bins for Little Hands guest blogging today for Project Gratitude. She is a busy mommy and she has great ideas for little ones on her blog. I have been trying to figure out how to share the meaning of Thankful with Liam this holiday season. To him, right now it is just another day, but I feel like even a small child can learn about gratitude and thankfulness for the small things in his life. Well, his teacher helped me out and in his back pack I found the names of his school friends written down on popsicle sticks. He showed them to me and said there was one for each of his friends and his friends make him feel happy. Hooray, I added that we can be thankful for our friends too. Sometimes a hands-on approach is all you need! I had recently purchased the book Bear Says Thanks by Karma Wilson to help with my own project gratitude and to learn a little the meaning of thankful, but I am happy to have had a little behind the scenes help from his teacher. I decided to stick with the popsicle stick idea, since it was working, and created a thankful sensory bin for the Bear and his friends. Often through sensory play, Liam really gets into a story. To start the bin, I found these great Bear and friends print outs on the Making Learning Fun website. I cut them all out as well as card stock outlines of each to glue them onto for more stability. Liam helped to glue each one on to its backing. Then we added a jumbo popsicle stick to make them into little puppets. All the while, we chatted about being thankful for friends in anticipation to reading the story, after we finished our props. We also started talking about other things he could be thankful for like our warm home and good food and the fun things we get to do together. 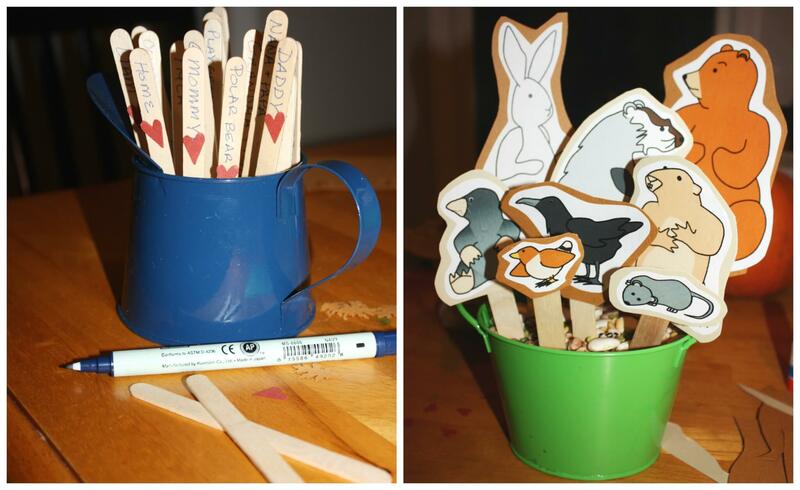 I decided to write them all down on popsicle sticks for him and we could add them to the bin as well. He had lots to be happy or thankful for, so we had lots of sticks! We completed the bin by filling it with dried beans. 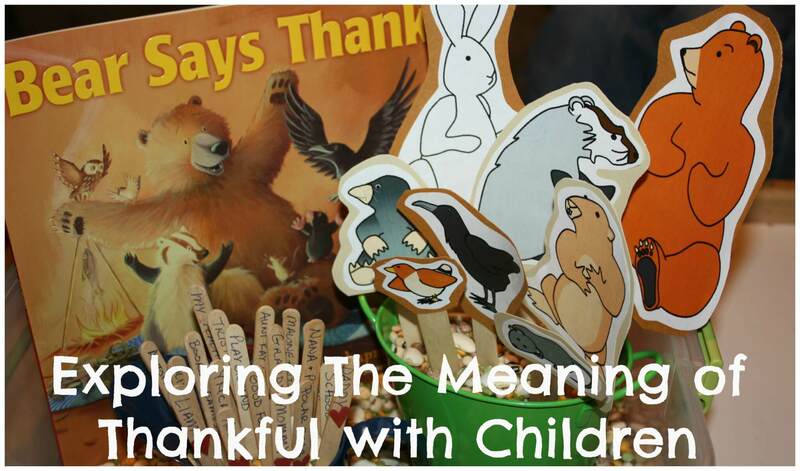 Then we added our buckets of animals and thankful sticks. He sat with me while we read the book together and then he got to work putting the animals around and talking about the story. He began pulling out our popsicle sticks and asking what was written on each again. I am so happy he gave me another chance to go over what we had chosen to be thankful for this afternoon! We also talked about what Bear and his friends were thankful for in our story! It was wonderful sitting together just chatting about what and who makes us happy every day and realizing that in my son’s own way he does understand what it means to be thankful! Liam was able to use story play to learn the meaning of thankful! He chose to create a feast for the friends and demonstrated a wonderful way of understanding the meaning of thankful! I am so pleased to be guest posting for Project Gratitude. We have so much to be thankful for everyday. Much more than I can write down on popsicle sticks that’s for sure. 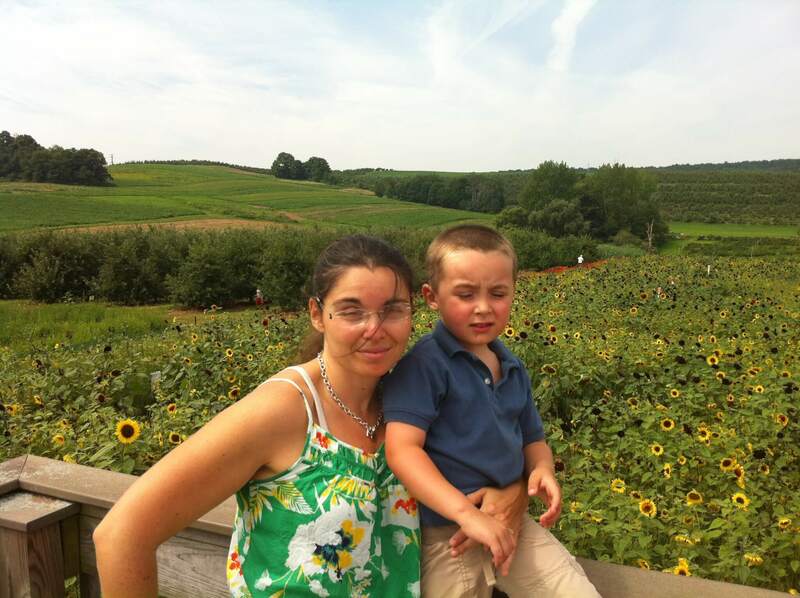 I am a SAHM to a wonderful but very active little boy with Aspergers, SPD and ADHD. Every day is an adventure and everyday I am grateful, thankful for the opportunity to spend this special time with him helping him learn how to be the best person he can be. Please stop over and see us at Little Bins for Little Hands to see more of my hands-on approach with his learning style! I tried to find the Bear Says Thanks cutouts you refer to in your blog but was unable to find them. Do you have the link to that? If so, could you print it? Thanks.